The cancelation of the latest talks over their disputed border, allegedly due to Chinese pressure on India over the Dalai Lama, is likely to stoke growing tensions. 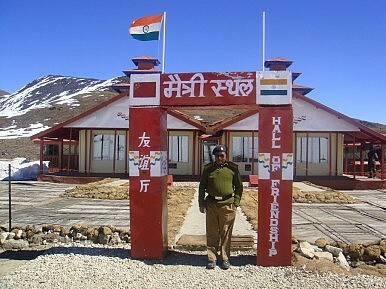 Clear signs of an approaching chill in India-China relations had been evident for the past couple of months. But the final confirmation that it may have arrived came Friday, when the two sides called off a crucial round of talks on their complicated boundary dispute, just two days before they were to begin in New Delhi. Although officially both sides maintained that scheduling issues were to blame for the postponement of talks, sources in the Indian establishment said last minute and “unacceptable” demands by Beijing forced New Delhi to call off this round of negotiations. Both sides have tried to play down the abrupt postponement. The countries’ two special representatives, India’s National Security Adviser Shiv Shankar Menon and Chinese State Councilor Dai Bingguo, were supposed to oversee the finalization of the “Mechanism for Consultation and Coordination on Border Affairs” resolving disputes in certain pockets on the 4,000 kilometer-plus line of actual control (LAC). The stalled defense dialogue was also expected to restart in the aftermath of the New Delhi meeting. But it has emerged that one of the key reasons that India has walked away from the talks is that Beijing asked India to prevent the Dalai Lama from speaking at a Global Buddhist Congregation starting in New Delhi on November 27. When India refused, China reportedly demanded cancellation of the conference itself, which India refused outright to do, arguing that it was a religious meet and not a political one. Analysts in India also feel Beijing has raised the pitch in the wake of a tense East Asia Summit in Bali last week when most ASEAN nations, India and the United States asserted their right for a multi-lateral solution to disputes in the region, including those in the South China Sea. Meanwhile, Beijing’s increasing presence in Pakistan-held Kashmir – something that India has objected vigorously to in recent months—is another wrinkle in the already complex relationship. Belligerent statements in China’s state-run media have, in India’s view, only added to the tension. “India jitters at the sight of China gaining prestige in Asia, in particular, in South Asia and Southeast Asia, and takes China's ever-growing regional influence in recent years as a strategic encirclement to target and contain India,” the official Xinhua news agency said in a commentary on its website earlier this week. Referring to India’s “Look East” policy of consolidating its ties with Southeast Asian countries like Vietnam and Japan, the commentary said New Delhi is trying to “instigate” China's neighbors to contain its influence. Is it China’s Turn to Pivot? The U.S. ambushed and isolated China at the East Asia summit. If China wants to recover it needs to manage its competition with the United States – and not scare its neighbors.